This recipe yields 40 truffles. Mix the crushed Oreo cookies with the cream cheese to form cookie dough. Use a teaspoon, or small meatball scoop, and form into balls of 1 inch in diameter, until all mixture is used up. Line couple of cookie sheets with parchment paper. Melt the chocolate morsels in a pot on the stove top (or in the microwave), and keep it warm at all time during the dipping process. Place one ball at a time on a teaspoon, roll it in warm chocolate mixture to coat. Place each ball on the lined cookie sheet, spaced out so they do not touch. 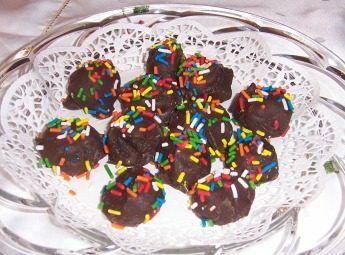 Sprinkle tops of truffles with colored sugar, or colorful sprinkles. Store truffles in a cool place, in a covered container, separating each layer with parchment. No need to worry about having these out at room temperature throughout your entertaining time, since they still keep their great taste and shape. These also make a wonderful addition to a cookie tin, to share with friends and coworkers. I would not recommend the Double Stuffed Oreo cookies, as they make the mixture too rich, thus much more difficult to coat them with chocolate.